Bellagio Gallery of Fine Art is Las Vegas’ premier rotating exhibition space—currently showing "Yayoi Kusama: Infinity Mirrored Room" – "Aftermath of Obliteration of Eternity" and "Narcissus Garden". Organized in partnership with museums and foundations both nationally and internationally, BGFA is committed to presenting intimate exhibitions in its 2600 sq. ft. space featuring works by some of the world’s most compelling artists. Aftermath of Obliteration of Eternity, a temporary art installation created and originally displayed in Japan, provides an interior passage route that is only 26 inches wide. This route can accommodate certain versions of “racing” wheelchairs, but not a standard 26-inch wide wheelchair. We apologize in advance for this inconvenience. The remaining portion of the gallery can accommodate a standard-width wheelchair. Children under the age of 5 are free. Must be accompanied by an adult. How long do I get to view the Infinity Mirrored Room – Aftermath of Obliteration of Eternity? The light cycle lasts for 45 seconds. You are guaranteed to view 1 cycle with ticket purchase. How many people can enter the Infinity Mirrored Room – Aftermath of Obliteration of Eternity at a time? Do I have to wait in line to view the Infinity Mirrored Room? Yes, depending on demand, you may have to queue inside the gallery before entering the Infinity Mirrored Room. How long do I get to view the Narcissus Garden? Yes, it is encouraged (without flash). Is this exhibition wheelchair accessible? Aftermath of Obliteration of Eternity (italicize), a temporary art installation created and originally displayed in Japan, provides an interior passage route that is only 26 inches wide. This route can accommodate certain versions of “racing” wheelchairs, but not a standard 26-inch wide wheelchair. We apologize in advance for this inconvenience. The remaining portion of the gallery can accommodate a standard-width wheelchair. I have sensitivities to lights or am uncomfortable with dark spaces. Are children allowed to experience the exhibition? Yes, children are very welcome to enjoy the artworks of Yayoi Kusama if they are accompanied by an adult at all times. Do I have to reserve a scheduled time to view the installations? Yes, slots are reserved in 1-hour increments with ticket purchase. Capacity per hour is 75 guests. 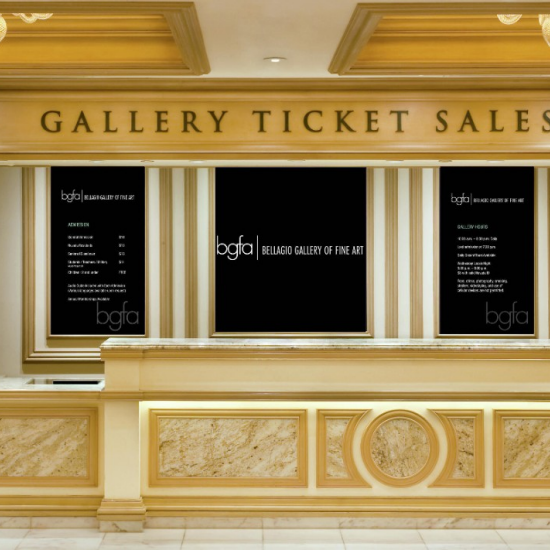 If you have obtained a special offer voucher, please call (702) 693-7870 or email fineartgallery@bellagioresort.com to reserve a time slot. Can I visit the exhibition more than once in a day? Same day re-entry is allowed with new ticket purchase. Last admissions are sold at 7:30 PM daily. Opening times may be subject to change due to private functions. We strongly recommend that you phone ahead to ensure available viewing times. If you are a confirmed guest of Bellagio, you may contact The Concierge at Bellagio by calling 866.906.7171 or 702.693.7075 for assistance with special pricing when purchasing tickets. All offers are subject to availability. Locals night every Wednesday after 5:00 PM. $11 admission for Nevada Residents with a valid Nevada ID. Anyone under 17 years of age must be accompanied by an adult. Touching of the Artwork is strictly prohibited. Special Policies: Food, drinks, smoking, strollers and videotaping are not permitted inside the gallery. All sales are final. No refunds/exchanges. Each ticket includes one 45 second light cycle in the “Infinity Mirrored room” Guests with light sensitivities use caution. Please be advised that on Tuesday, January 8th, 2019 The Bellagio Gallery of Fine Art will close at 5pm with the last admittance at 4:30pm for a private event. Please be advised that on Wednesday, January 9th, 2019, The Bellagio Gallery of Fine Art will close at 4pm with the last admittance at 3:30pm for a private event. Please note that the Bellagio Gallery of Fine Art will re-open with normal business hours on Thursday, January 10th, from 10:00am – 8:00pm with the last entry at 7:30pm.